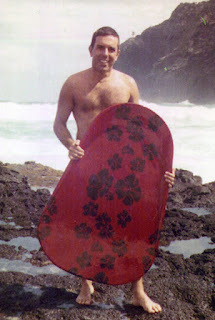 Jim Growney donated 2 Hawaiian Paipos (he's pictured here with one of them that belonged to John Waidelich) along with a collection of photos of them being ridden. This one is now part of our "Alternative Wave Riding Equipment" display. Growney is pictured below riding a Paipo at Sunet Beach on the North Shore. Photo by Val Valentine.